Age Limit: Candidates age should be between 18 to 28 years as on 01-01-2015. Age relaxation is applicable as per Govt Rules. Educational Qualification: Candidates should have passed 10th class/ Higher Secondary (Under 10+2 pattern)/ Equivalent examination from recognized board or Institute, 8th class for (ST candidates). Selection Process: Candidates will be selected based on performance in Physical Efficiency Test, Written examination & Medical Fitness test conducted by Chhattisgarh Police Recruitment Board. Application Fee: Candidates have to pay Rs. 200/- for General & OBC candidates, Rs.125/- for Reserved category candidates. Application Form: Application forms availabe in related Sales/ Recruitment Centres From 30-03-2015 to 20-04-2015. How to Apply: Eligible candidates may send their application through prescribed format & all copies of relevant documents to related Recruitment centres under Sales centres mentioned in the Notification & Corrigendum (Given below) From 30-03-2015 to 20-04-2015 till 05:30 PM. Starting Date for Submission of Application: 30-03-2015. Document Verification, Physical Efficiency Test: From 25-04-2015 to 04-05-2015. Thank you sir, to provide me CG Police Recruitment 2018 information which is really useful for me. CG Police Recruitment 2018 avilable for 4045 Constable (GD), Cook, MT Driver and other posts. Applicants can apply online for Chhattisgarh Police Recruitment from 26.01.2018 to 15.02.2018. The apply online links are available at cgpolice.gov.in. Candidates can start submitting the cg police online form. CG Police Recruitment 2018 has announced a notification for 215 Constable (Telecom, Driver, MT, DEO) Vacancy. Candidates who are interested in Chhattisgarh Police Jobs can fill up the application form through online mode. The last date for submission of an application for CG Police Vacancy is 15.02.2018. 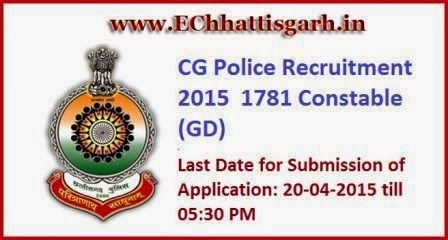 The CG Police Department is inviting CG Police Recruitment 2017 - 18 application form for 2976 Constable (GD) | Tradesman Posts in all the districts of Chhattisgarh state. SSC GD Constable Notification will be uploaded on 21.07.2018 by Staff Selection Commission. Eligible participants may apply through online mode.